Award-Winning Cozy Mysteries from Nancy G. West! Nancy G. West was a business major who discovered that writing mysteries is a lot more fun than accounting. While she was writing her award-winning suspense novel, Nine Days to Evil, a funny thing happened. Supporting character Aggie Mundeen demanded that Nancy write about her. Aggie was on to something. 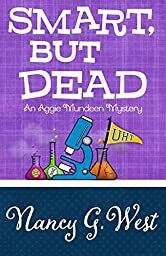 Aggie's first caper, Fit to Be Dead, won Chanticleer’s Award for Mystery & Mayhem and was Lefty Award Finalist for Best Humorous Mystery. Dang Near Dead was a Chanticleer finalist. Smart, But Dead and River City Dead are Short-listed for the Mystery & Mayhem Award. Nancy lives in San Antonio, the setting for River City Dead, and daydreams about Aggie’s next adventures. Aggie Mundeen, single and pushing forty, fears nothing but middle age. When she moves from Chicago to San Antonio, she decides she better shape up before anybody discovers she writes the column, "Stay Young with Aggie." She takes Aspects of Aging at the University of the Holy Trinity and plunges into exercise at Fit and Firm. Rusty at flirting and mechanically inept, she irritates a slew of male exercisers, then stumbles into murder. She'd like to impress the attractive detective with her sleuthing skills. 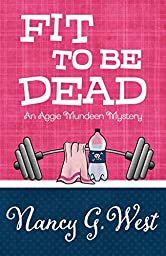 But when the killer comes after her, the health club evacuates semi-clad patrons, and the detective stalls his investigation to save Aggie's derriere. 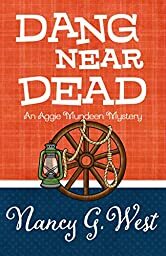 Aggie vacations with Sam and Meredith at a Texas Hill Country dude ranch with plans to advise her column readers how to stay young and fresh in summer. Except for wranglers, dudes, heat, snakes and poison ivy, what could go wrong? When an expert rider is thrown from a horse and lies in a coma, Aggie is convinced somebody caused the fall. Despite Sam's warnings, Aggie is determined to expose the assailant. She concocts ingenious sleuthing methods that strain their dicey relationship as she probes secrets of the ranch and its inhabitants. After she scatters a hornet's nest of cowboys, she discovers more than one hombre in the bunch would like to slit her throat. Skirting forty and appalled by the prospect of descending into middle-age decrepitude, Aggie Mundeen blasts off to the local university to study the genetics of aging. In addition to providing youthful hints for readers of her column, "Stay Young with Aggie," Aggie is doggedly determined to stay young. Despite conflicts with her professor, she learns about the Human Genome Project and DNA. When she discovers a dead body, Detective Sam reminds her not to "help" with the investigation. But dangerously curious and programmed to prod, she races to solve the crime, winds up the prime suspect, and is on target to become the next campus corpse. "Smart. Aggie Mundeen is smart. But. But she's also a little clumsy, irrepressible, and irresistible. Dead. She might well end up dead if she continues nosing around the university where her questions are not wanted. Smart, But Dead is the perfect combination of brains and heart. A tight mystery, an irrepressible heroine, and superb writing." -- James W. Ziskin, Anthony Award Winner for the Ellie Stone Series. River City Dead #4 $2.99 NEW! “Like taking a vacation while reading a mystery. A great series with fun characters. The perfect keepsake." – Amazon and Goodreads reviewer. 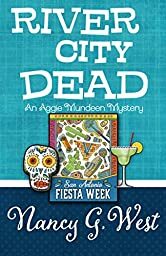 Advice columnist Aggie Mundeen and SAPD Detective Sam Vanderhoven plan their first rendezvous at a San Antonio River Walk hotel during Fiesta Week---sumptuous sights, sounds, and festivities in the middle of America's Venice. A vacation from crime and a reset for their tumultuous relationship. But murder descends on the Casa Prima Hotel. Disturbing revelations surface about the Fabulous Femmes, Aggie's new friends holding a convention. Evil emerges at parties in La Villita. Calamity plagues Aggie's debut dance performance at the Arneson River Theater, the celebration skewed by carousing, crazies, and corpses. Even in idyllic River City, crime complicates relationships.